* Win 2 Tickets: Secrets Of Self-Made Millionaires. 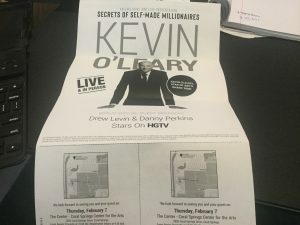 Got 2 complimentary tickets to attend Secrets Of Self-Made Millionaires on Thursday, February 7th, 2019 (registration begins at 9:30am, event begins at 10am) at the Coral Springs Center for the Arts, 2855 Coral Springs Drive, Coral Springs…the event headlines Shark Tank’s Kevin O’Leary. Not exactly sure what this event is all about, but the best guess is that Mr. Wonderful (O’Leary) is looking to sell you something! Just a thought, but don’t “these” type of events usually buy you a steak or lobster dinner to get you to come? Anyone who says that you don’t call it like you see it, is a dope. This O’Leary event is a perfect example of how straight jeffeats.com plays it. You’re blog is like a breath of fresh air compared to most of the other food/ entertainment blog sites out there. You are right, attendees to these top of events get a steak dinner to attend. That said, since the event is being held in the morning at worst there should be a huge buffet breakfast being served. you have been warned. If you go you have no wallet and no credit cards.